Deb's Cup of Tea: Do You See It? I got the hairs cut on Monday. The bangs had grown enough they were hanging in my face, covering half of my eyes. When I made the decision to get the cut, I was just going to get the bangs done, but the rest of the hair started to bug me, so I had her cut everything. I feel like a Q-Tip. She said my hair had grown 2 inches from the last cut, which had been right after Thanksgiving. I don't doubt that, but she took more than 2 inches off. It's a bit short for my overall comfort but it's just hair. It will grow out. As she was cutting my hair she said, "I like the lavender color you added. Since you just get a cut here, did you go some place or add it yourself?" I stared at her. I have not colored my hair in nearly 6 years. 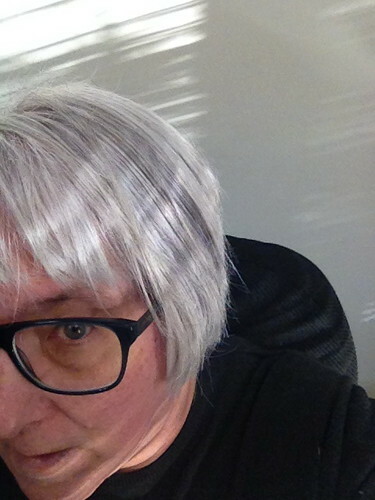 In fact, here is the blog post from when I decided to stop coloring my hair. Her comment caught me off guard. "I don't color my hair," I replied. "Oh," she said. "Interesting. There's a section here that's light purple." She pointed to a section on the back left side of my head. Honestly, I didn't see anything and I kind of felt the fluorescent lights of the shop were playing tricks on her eyes. Later, however, as she was making sure everything was even, I saw it. It's a small section, but it is a light lavender. How the heck...? Do you see it? It's a thin stripe toward the back of my head as well as some undertones near the ears. There is also, in this photo, a light yellow stripe. That could be just sunlight. 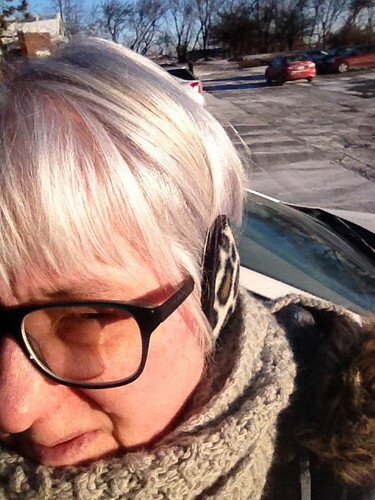 Gray hair has a tendency to go "brassy", it's called; take on yellow overtones. I have noticed that and it makes the hair look dirty, even when its not. I use a shampoo formulated for gray hair which removes this yellow tint and leaves just the gray visible. I like my gray hair. There are some days when I think, "I should dye it back to my original brown color", but I remember how long it took to grow out and how bad it looked at the end. I was rather happy when it had grown out enough that all the faded brown could be cut off. At this point, I think dying it brown would look fake. The gray shampoo is a bright royal purple. The gray conditioner is a light lavender. You aren't to use this but once a week because it will dye your hair purple. I only use it when I have to be somewhere and feel there's too much yellow in my hair. I had been out and about with Pam last Saturday, but had used regular shampoo. Plus, I don't wash my hair every day. Increasingly, the science is saying a break from washing is good. I'm in an every other day routine unless I need to make sure it looks good. And then, if I'm not going somewhere over a weekend, I'll just wet it down and leave it, so I can go a Friday morning to Sunday evening without the application of shampoo. That sort of rules out having the shampoo be the culprit in the dye job. Here it is this morning, in the office. The lavender color is easier to see. I'm at a loss for how it got there. I didn't use my gray shampoo over the weekend. I didn't think the hair needed it. But that's purple. One of my Internet friends, who changes her color about every 6 weeks, thinks the hair has been absorbing the purple dye for some time. It was hidden in my shaggy growing out cut of before. It will go away, gradually, unless I continue to use the purple shampoo on a weekly basis. In which case, it could get more pronounced. As I have a great body of inspections upcoming, I don't want to be too distinctive. I kind of like it, now that I see it. It's funky and I'm ready for some funky in my life. I need new glasses, too. No, I'm not getting purple frames.